Below are common attributes associated to American Boxwood. Become a care taker for American Boxwood! Below are member comments regarding how to plant American Boxwood. No comments have been posted regarding how to plant American Boxwood. Be the first! Do you know how to plant American Boxwood? Below are member comments regarding how to prune American Boxwood. No comments have been posted regarding how to prune American Boxwood. Be the first! Do you know how to prune American Boxwood? Below are member comments regarding how to fertilize American Boxwood. No comments have been posted regarding how to fertilize American Boxwood. Be the first! Do you know how to fertlize and water American Boxwood? Below are member comments regarding how to deal with American Boxwood's pests and problems. 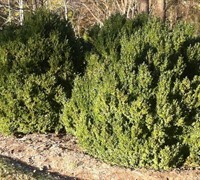 No comments have been posted regarding how to deal with American Boxwood's pests and problems. Be the first! Do you know how to deal with pests and problems with American Boxwood? Get American Boxwood fresh and large directly from the grower to your garden! Buy American Boxwood online from the nursery wholesalers and save BIG! Some folks here in the South have had some problems with disease on their American Boxwoods. Sections of the shrub will just die out. This is probably due to consistently wet soil conditions. Fertilize in spring with a well-balanced, slow-release shrub and tree food. If chlorosis develops (yellowing of the foliage) apply additional Iron or sulphur. Though American Boxwood can be sheared, there is no need for pruning. It keeps a dense, rounded conical shape all on its own.